Septimus Signus is an elderly former scholar of the College of Winterhold, now living in seclusion in a remote outpost in the Sea of Ghosts. 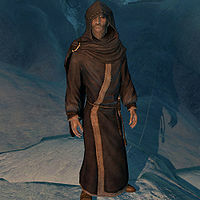 He is an expert on Elder Scroll lore and author of the book Ruminations on the Elder Scrolls. Due to this expertise you will be pointed towards him during the quest Elder Knowledge. 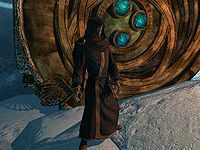 He will offer to help you out if you do him a 'favor' in return, helping him unlock the Dwemer lockbox in the outpost as part of his own quest, Discerning the Transmundane. His lonely life in the outpost consists of nothing but pacing around the cave, without ever eating or sleeping. The only exception occurs during the final stages of Discerning the Transmundane when he finally manages to unlock the Dwemer lockbox. Septimus wears blue mage robes and a pair of boots and carries an iron dagger. If you provoke him into attacking you, he will use taunts such as: "Your depths will open to the mind! ", "Your length is cut! ", "Open to the will of Septimus! ", and "Into the dark with you!" When you locate Septimus Signus's Outpost, a small ice cavern on a remote island in the Sea of Ghosts, you will find the former College scholar pacing around inside, seemingly obsessed with a huge cube with a strange lock. 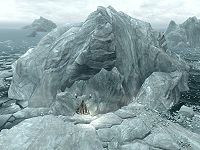 Something is clearly wrong with Septimus, as he will ramble to himself: "Dig, Dwemer, in the beyond. I'll know your lost unknown and rise to your depths. ", "When the top level was built, no more could be placed. It was and is the maximal apex. ", "How long will it be sung? My feet were set upon the rock but it turned to mud and drew me down. ", "It lick the panes and smokes the glass..." Even if he is as incomprehensible as his book, you will have no choice but to attempt to understand what he is saying. Two options are available. When asked what he is doing out here, he will answer: "The ice entombs the heart. The bane of Kagrenac and Dagoth Ur. To harness it is to know. The fundaments. The Dwemer lockbox hides it from me. The Elder Scroll gives insight deeper than the deep ones, though. To bring about the opening." When asked if he has an Elder Scroll in the cave he will state: "I've seen enough to know their fabric. The warp of air, the weft of time. But no, it is not in my possession." When confronted with the fact that he is knowledgeable about the Elder Scrolls he will admit: "Elder Scrolls. Indeed. The Empire. They absconded with them. Or so they think. The ones they saw. The ones they thought they saw. I know of one. Forgotten. Sequestered. But I cannot go to it, not poor Septimus, for I... I have arisen beyond its grasp." Regardless of your previous choice of topic, two options are now available; either ask where the scroll is, or ask Septimus if he is all right. The latter option will net you: "Oh, I am well. I will be well. Well to be within the will inside the walls." This leaves the question for the scroll's location: "Here. Well, here as in this plane. Mundus. Tamriel. Nearby, relatively speaking. On the cosmological scale, it's all nearby." Another two options will pop up as you can either be patient or aggressive; these approaches will only lead to Septimus asking a favor for helping you out. The patient response will make him say: "One block lifts the other. Septimus will give what you want, but you must bring him something in return." The aggressive approach will see him say: "Oh, a brutish one. Septimus has no fear of you. But as one block raises another, perhaps ourselves could help us each." "You see this masterwork of the Dwemer." 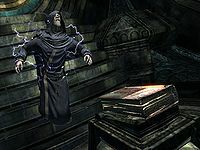 While you need the Elder Scroll, Septimus needs the knowledge it possesses so he can open his Dwemer lockbox: "You see this masterwork of the Dwemer. Deep inside their greatest knowings. Septimus is clever among men, but he is but an idiot child compared to the dullest of the Dwemer. Lucky then they left behind their own way of reading the Elder Scrolls. In the depths of Blackreach one yet lies. Have you heard of Blackreach? 'Cast upon where Dwemer cities slept, the yearning spire hidden learnings kept.'" After listening to his insane laughter, you can ask about the location of Blackreach: "Under deep. Below the dark. The hidden keep. Tower Mzark. Alftand. The point of puncture, of first entry, of the tapping. Delve to its limits, and Blackreach lies just beyond. But not all can enter there. Only Septimus knows the hidden key to loose the lock to jump beneath the deathly rock." It is apparent that without Septimus you will not be able to reach your goal, so ask him how to get in: "Two things I have for you. Two shapes. One edged, one round. The round one, for tuning. Dwemer music is soft and subtle, and needed to open their cleverest gates. The edged lexicon, for inscribing. To us, a hunk of metal. To the Dwemer, a full library of knowings. But... empty. Find Mzark and its sky-dome. The machinations there will read the Scroll and lay the lore upon the cube. Trust Septimus. He knows you can know." He will hand you the two items, an Attunement Sphere and a Blank Lexicon, and will be more than willing to explain their usage. On the Sphere, he will explain: "The deepest doors of Dwemer listen for singing. It plays the attitude of notes proper for opening. Can you not hear it? Too low for hearings?" On the Lexicon he will admit: "To glimpse the world inside an Elder Scroll can damage the eyes. Or the mind, as it has to Septimus. The Dwemer found a loophole, as they always do. To focus the knowledge away and inside without harm. Place the lexicon into their contraption and focus the knowings into it. When it brims with glow, bring it back and Septimus can read once more." When asked what he expects to gain from the Elder Scroll, he will be surprised: "Ooooh, an observant one. How clever to ask of Septimus. This Dwemer lockbox. Look upon it and wonder. Inside is the heart. The heart of a god! The heart of you. And me. But it was hidden away. Not by the Dwarves, you see. They were already gone. Someone else. Unseen. Unknown. Found the heart, and with a flair for the ironical, used Dwarven trickery to lock it away. The scroll will give the deep vision needed to open it. For not even the strongest machinations of the Dwemer can hold off the all-sight given by an Elder Scroll." Before you head off to Alftand he will provide a fittingly complex definition on an Elder Scroll: "You look to your left, you see one way. You look to your right, you see another. But neither is any harder than the opposite. But the Elder Scrolls... they look left and right in the stream of time. The future and past are as one: Sometimes they even look up. What do they see then? What if they dive in? Then the madness begins." "I thought there were no secrets left to know." In between all the ramblings and complexities, you will find some of Septimus' advice useful during your trip through Alftand, Blackreach, and Tower of Mzark. 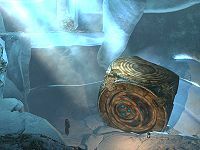 When you return with the inscribed Runed Lexicon, Septimus will still be more than talkative and explain why it is important for him to see the Dwemer lockbox open: "The box contains the heart. The essence of a god. I have devoted my life to the Elder Scrolls, but their knowledge is a passing awareness when compared to the encompassing mind of divinity. The Dwemer were the last to touch it. It was thought to have been destroyed by the Nerevarine, but my lord told me otherwise." He will then reveal who his 'lord' is: "The Daedric prince of the unknown. Hermaeus Mora. I thought there were no secrets left to know. Until I first spoke to him. He asks a price -- to work his will. A few murders, some dissent spread, a plague or two. For the secrets I can endure. In time, he brought me here. To the box. But he won't reveal how to open it. Maddening." When you tell him you inscribed the Lexicon, he will take it from you immediately. If you haven't reached level 15 yet, Septimus will tell you "Oh, but the Dwemer had more than even Septimus expected. This will take time to decryptify. Be on your way, and Septimus will find you if he has further need." Otherwise the quest continues immediately, "Give it, quickly. Extraordinary. I see it now. The sealing structure interlocks in the tiniest fractals. Dwemer blood can loose the hooks, but none alive remain to bear it. A panoply of their brethren could gather to form a facsimile. A trick. Something they didn't anticipate, no, not even them. The blood of Altmer, Bosmer, Dunmer, Falmer, and Orsimer. The elves still living provide the key. Bear you hence this extractor. It will drink the fresh blood of elves. Come when its set is complete." He will then hand you the Essence Extractor and do absolutely nothing until you return with the extracted blood of the five races. However, wise as he may be, he doesn't realize that he is a tool for Hermaeus Mora, as an entity called Wretched Abyss will emerge near the entrance and talk to you: "I am Hermaeus Mora. I am the guardian of the unseen, and knower of the unknown. I have been watching you, mortal. Most impressive." The Daedric Prince will then tell you the real scheme: "Your continuing aid to Septimus renders him increasingly obsolete. He has served me well, but his time is nearing its end. Once that infernal lockbox is opened, he will have exhausted his usefulness to me. When that time comes, you shall take his place as my emissary. What say you?" Regardless of your answer to Hermaeus Mora, Septimus will be most excited when you return with the extracted blood: "I can almost... hear them. I feel their life energy. Come, I will make the mixture." He will then pull out a device and take a moment to do the mixture. After that, he will unlock the Dwemer lockbox with ease and watch as the lock itself turns into a tunnel. When he reaches the center and only finds a pedestal with a book, he will be disappointed: "What is this... it's... it's just a book?! I can see. The world beyond burns in my mind. It's marvelous...." Seconds later, Septimus Signus is dead, reduced to an ash pile, as he outplayed his role for Hermaeus Mora. When you take the Oghma Infinium the Wretched Abyss will appear in the tunnel behind you for one last explanation: "Now you have my Oghma Infinium. It contains the knowledge of the ages as revealed to Xarses [sic], my loyal servant. For hundreds of years it's been shut away from the world. Septimus was a useful tool for unleashing it. Now it is in your hands. Let us work wonders together..."
Septimus Signus is a member of the warrior class, which determines the level of his skills. Septimus Signus is voiced by Paul Eiding. This page was last modified on 14 October 2018, at 07:17.